Solvent Purifier Frequently Asked Questions | LC Technology Solutions Inc.
1. What type of power is required to run the system? The only item on the solvent purifier that requires power is the vacuum pump. For 115V systems the vacuum pump requires about 2 amps of power. For 220V systems the vacuum pump requires about 1 amp of power. A standard wall outlet is typically sufficient for this application. 2. Does the system need to be grounded? The system is already grounded to the vacuum pump which is then ground to earth ground through the power cord. No additional grounding is required. 3. What type of gas do I need to run the system? You will need inert gas (either nitrogen or argon) to run the solvent purifier. This should be high or ultra-high purity gas with less than 10 ppm of oxygen and moisture. 4. What pressure gas do I need to run the system? The inert gas bottle will need to have a regulator that is capable of delivering 15 PSI of inert gas to the system. The system contains an internal regulator that is set to deliver 7 PSI within the system. A regulator at the gas supply (bottle) is required. 5. Where is the gas connection for the system? The gas connection for all of the solvent systems is on the back of the system. There is a gas inlet label on the back showing the connection point. This is also shown on your approval drawing. 6. Are there any special requirements for the solvents that I use in the system? There are several requirements for the solvents. It is recommended that you purchase ACS grade or better solvents with no more than 250 ppm of moisture content. If you are planning to use THF or ether it must be inhibitor free. The inhibitor (BHT) will react with the filter material and clog the system. 7. How much solvent do I need to start my system? For the full size solvent purifier we recommend filling the kegs with 16 liters of solvent. For the bench top solvent purifier you will need 8 liters to fill the system. 8. Are the solvents filtered inside the system? Yes. Each solvent channel has a particle filter. If you are using methanol your system will also have a special particle filter attached to that channel. 9. How do I fill the kegs with solvent? This is very easy to do and is well explained in the manual. Refer to Section 3.5: Filling the Solvent Kegs. 10. How do I start up the system? This is very well explained in the manual. Refer to Section 5.1: Initial Start Up. 11. How do I dispense solvents? This is also very well explained in the manual. Refer to Section 5.2: Operation of the Solvent System. 12. Is there any maintenance for the system? The system is maintenance free and should not require any regular maintenance. 13. Does the vacuum pump need to run all of the time? The vacuum pump is not required to run the system 24/7 but is needed to operate the solvent purifier correctly. We recommend leaving the vacuum pump on all of the time. 14. What connections need to be vented on the system? The vacuum pump exhaust should be vented out of the building through an exhaust connection. On full size systems you can also vent the fire cabinet and the top of the solvent purifier cabinet. This helps reduce the solvent vapors in the lab when using the system. The vent connections are shown in the operation manual. Refer to Section 3.4: Utility Connections. 15. How large is the system? The full size system only comes one size (52” L x 34” W x 69” H). The bench top systems come in various sizes depending on the number of channels requested. Your system was supplied with a drawing showing the exact size and this information is also available on the literature supplied. 16. What kind of dispensing connections are on the system? The system is supplied with Teflon 24/40 connectors. Many other connection types are available upon request. 17. How many collection vessels are supplied with the system? 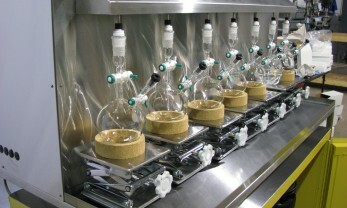 The system is supplied with one glass collection vessel for testing. Additional glassware can be supplied upon request. 18. How do I assemble my system? Your full size system was delivered fully assembled. All you need to do is unwrap the system and the kegs. Remove all of the packing material and connect all of the color coded lines. Your bench top system needs some assembly. Please refer to the drawing of your system. Every piece of your system has a number label attached to it. If you match up the numbers each connection will be made correctly and the system will be assembled. This typically takes between 10 and 30 minutes maximum. 19. What is the purpose of the color coding? The color coding of the system is very important. You must always connect the correct color kegs to the matching colored lines to the same color solvent channel. (Example: Red keg, attached with red lines (gas and solvent), to red solvent channel). This color coding is important to keep the correct solvent in the correct kegs. Once you decide to put say, THF in the red keg, then it will always be in the red keg, red lines and red solvent channel. This is important to keep from cross contaminating your solvents. 20. Can I use more than one type of solvent per solvent channel? No. Once you have used one type of solvent in a solvent channel you cannot switch to another type of solvent. This would cause large amounts of cross contamination. If you want to change solvent types you would need to replace the filter columns (or the material), the particle filter, and clean out the entire channel of all of the old solvent. Then you could use a new type of solvent in this channel. 21. How much solvent can the system dry before I need to replace the solvent drying columns (filters)? If you use solvent with a starting moisture content of 250 ppm or less the columns should dry approximately 800 liters. If the starting moisture content is higher, the amount is correspondingly decreased. Example: 500 ppm would equal 400 liters. 22. My acetonitrile has a slight pink hue to it. What would cause this and how do we remedy it? Typically this is caused over time by solvents sitting in the filter columns unused for long periods of time. The solvent then reacts with the filter material and sometimes produces odd colors. Try dispensing 2-4 liters of solvent to flush the system. If this does not solve the problem, the filter columns will need to be replaced. 23. Can we switch from ether to chloroform once we get new columns? If you want to use a different solvent you will need new columns and an in-line filter. You will also need to remove the piping for that particular channel and thoroughly wash and dry them before using the new solvent. These steps are critical to avoid cross contamination. 24. Are used columns of any value? Can they be reconditioned with new catalyst if sent in? Used columns are of value. See instructions on how to repack the filter columns yourself. You will need to purchase the necessary filter material to repack the columns. Please note this is a time consuming process. We recommend purchasing our pre-packed, activated filter columns. The replacement columns cost $350 each and you will need two columns. Click on the links below to view and download the appropriate manual for your system. All LC Technology manuals are in PDF format. You will need Adobe Acrobat Reader to open the files. You can download a free copy of Adobe PDF Reader from https://get.adobe.com/reader/.